So Metroid amiright? We haven't had a proper one in, what, coming up on five years?! Recently I've had the honor of retracing our favorite armor-clad bounty hunter's steps, through the jungles of Tallon VI, the temples of Aether, as well as the fantastic vistas of the planets in one of the Federation systems. I also took off my rose tinted visor and saw Metroid: Other M for what it really was and took a third look at Metroid Prime: Hunters. I know it's been done many times, many ways (Merry Christmas? ), so I won't make a whole run of it. Let's have a quick and dirty review of the 3D experiences of Samus Aran shall we? Metroid Prime is one of the most beloved modern Nintendo games, and has garnished critical acclaim from across the gaming world. 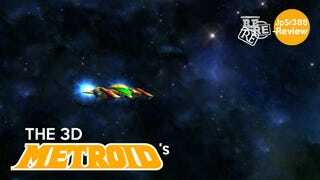 It's polished world, gameplay, and soundtrack put Retro Studios on the map and brought Samus Aran into the 3D world. You had everything that a 2D Metroid title would do and more, even down to special cutscenes (Spoiler: Introducing us to Dark Samus) for 100% completion. It also introduced Metroid fans to the Scan Visor, what I personally believe is it's greatest asset. The scan visor opened up the world of Metroid lore farther than ever expected. Despite being an amalgamation of many types of game styles with intense combat, the real star of the game was it's feeling of immersive isolation. Between the moments of combat you were still a solitary hunter exploring flora, fauna. The history of the grand planets you visited served as support for other aspects that the game got right. It's the living world around you that turned what could have been a good but forgettable game into a masterpiece. That isolation carried over to Prime 2 (arguably the most difficult Prime game). It added a simple but effective ammo system and a set of beautiful new suit upgrades (why hello there, Light Suit). In all other aspects Echoes simply refined and perfected the original Prime concept. We continued our battles with the Space Pirates (Though they inexplicably looked different) and were introduced proper to Dark Samus, who is now an icon in Metroid mythos as famous as Ridley. Retro even dabbled with some multiplayer, that would pretty much never appear again sadly. The isolation was somewhat eschewed for a feeling of urgency in Prime 3, but a complex world was present in every planet Samus Aran visited. We did gain what I consider to be the apex of immersive gameplay in Metroid, with the use of the Wii Remote and Nunchuck. The motion controls were used sparingly enough to make it novel, instead of a hassle. The only real complaint I had was that despite the premise, the game lacked Epicness. One of the final cut-scenes where the Federation ships travel through the wormhole was UNDERWHELMING! Minor criticisms aside, Retro finished up the on a high note, (Spoilers) possibly leaving it with a continuation if you completed it 100%, another hunter's ship following after Samus as she zoomed off. Speaking of 100% I really like that they included a room that put on the map where all the pick-ups were if you wanted the help, because there's always that one missile and you're left wandering trying to remember which one you missed. Who'd forgotten about this title? I didn't forget about it as much as it's been overshadowed by the possibly superior experiences on home consoles. The story was basic and solid. The aesthetic and gameplay mimic that of it's Gamecube brethren. All in all a great game that did everything it could with the what was then great hardware it had. It's greatest hinderance WAS that hardware though, meaning awkward controls and constant hand cramps. What sets Hunters apart is the exploration of online multiplayer that the Metroid series sadly hasn't been revisited since. With a nice roster of various other hunters, all different enough to be unique, but easy enough to understand, Hunter's is what I hope will be the basis for Metroid's next foray into online multiplayer. Oh Other M, I wish my replay of you was better… It wasn't terrible. Gameplay wise it was solid enough! The environments were fun I guess. And we had all those fantastic and true to memory interpretations of classic Metroid enemies. Except for Ridley… that whole thing really just made me ask more questions than anything. And that story, it really didn't do anything for me. I liked the idea of the Federation trying to militarize weapons, but the execution in the story was underwhelming. One thing that Team Ninja knows how to do is put together a cutscene. Kill animations and being aver to hurdle over ledges were a really nice touch, and those save game sequences were very pretty! I mean, really, don't let me dissuade you. Each of the pieces, held separately, are pretty great! But when Nintendo decided to package it all together, couple with a disappointing and sometimes confusing story, didn't add up to a greater whole. So what was everyone else's experience with these titles? I know there's a bit of hate for Other: M out there, but I love differing opinions! Next time with JpSr388: Learning from the past to make the next Metroid great(er).